In June/July 2007 I visited Turkey for two weeks. I flew into İstanbul and rented a car there and started driving. In the two weeks I drove a total of over 6,000 km (3,700 miles). But Turkey is a pretty big country, so I saw only the western ⅔rd of the country. As always I used a guide book from Lonely Planet as my guide. As far as I am concerned they produce the best guides, at least for my purpose. Most of Turkey is in Asia, between the Mediterranean in the west and Georgia, Armenia, and Iran in the east, and the Black Sea in the north and Syria and Iraq in the south. The small European part is separated from Asia by the Çanakkale Boğazı (Dardanelles Strait), the Marmara Denizi (Sea of Marmara) and the İstanbul Boğazı (İstanbul Strait or Bosporus). This waterway is a very busy and important shipping lane between the Mediterranean and the Black Sea. It was very important in the Antique and still is today. What I wanted to see most were the sites of the old civilizations that warred and merged in Anatolia. As it turned out, I was pleasantly surprised by the multitude of fantastic sites. As far as Nature is concerned, I didn't expect all that much, Turkey doesn't have many spectacular natural wonders. However two were extraordinary, the white Travertine Terraces at Pamukkale and the sandstone cones in Cappadocia. Following is a description of my route through Turkey and some observations, collected while driving through the country. Since I arrived at the airport at midnight, I stayed in the airport hotel for the first night. The next morning I picked up the rental car and drove west, away from İstanbul. I left the city for the end of the trip, cities are not high on my list of priorities. I drove along the Sea of Marmara towards the Dardanelles Strait. Just before getting to Eceabat the road leads through the Gallipoli Battlefields, site of a fierce World War I battle. From Eceabat I took the ferry (there are no bridges over the Dardanelles) to Çanakkale and stayed there overnight. Early in the morning I drove to Troy, one of the most famous sites of ancient Turkey. It is the site of the Trojan War, reported in Homer's Iliad. I was there at opening time, which meant I had the site to myself for a little while. When I left, the tour groups already had started streaming in. I tried that successfully at several of the main sites. From Troy I headed south along the Mediterranean. There are lots of antique sites along that coast. The next one was Alexandria Troas, a site built by one of Alexander the Great's generals. This site is not very developed, so you can see what these ruins look like in their natural state. 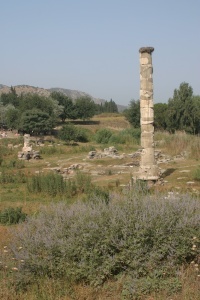 Next was Apollo Smintheion near Gülpinar, a once-great temple. Next was Assos, and from there to Pergamum. Pergamum is a great site with two parts, the Asklepeion and the Acropolis. From there I drove to Selçuk, where I stayed overnight. Here I was way overcharged by the hotel. It was late and the first hotel was full, so I took the room, but I shouldn't have. He really took advantage of me there. That was the low point of my trip. Selçuk is the city next to Ephesus. There are also the small remains of a very large temple of Artemis, one of the original Seven Wonders of the World, and the remains of a Byzantine aqueduct in the center of town. Ephesus is one of the highlights of Turkey. It is a large Roman city with spectacular buildings, and a fantastic theater. The next stop after Ephesus was Priene. This is another very nice city, mostly Hellenistic, with a large Temple of Athena. From there I drove south to nearby Miletus with its beautiful, large theater. From there it was to Didyma with the spectacular Temple of Apollo. The columns of this temple were by far the highest of all the temples that I saw in Turkey. Euromos was the next stop. This site is not well know, you have it all to yourself. But its Temple of Zeus is very nice, and it is interesting to go and find the totally overgrown theater. The next stop was Labranda. So far all the sites were very easy to get to. Labranda is different. It is high in the mountains, and the road is unpaved. But it has some interesting buildings that are well preserved. From there I continued on the unpaved road over the mountain towards Pamukkale. I like driving on such roads, it is fun for me. In Pamukkale I stayed overnight. This time the hotel rate was very reasonable and the people were very friendly and accommodating. The next day I visited the white Travertine Terraces of Pamukkale and the Roman city of Hierapolis that is built above the terraces. The Travertine Terraces are spectacular, and Hierapolis is one of the most interesting sites in Turkey with its vast Necropolis and very nice theater. After Pamukkale I drove to Aphrodisias. This was for me the nicest Greek/Roman site. It is large and has many very nice buildings, including a large Temple of Aphrodite. From there I headed south to Fethiye. Just past Fethiye is Tlos. This is a fine Lydian site, with a small theater and many rock-carved tombs. From Tlos I headed back to Fethiye to stay there overnight. In Fethiye is Telmessos with some fine rock-carved Lydian temples. In the streets of Fethiye are many Lydian stone sarcophagi. The next morning I was on my way to Termessos. This is one of the most spectacularly located sites, high up on a mountain, with fantastic views into the surrounding valleys. It has a nice theater, tombs and temples. Because of its location it is not visited much, so you may be alone or with just a few other people. It is well worth a visit. From there I headed for Çatal Höyük, the oldest city in the world. Unfortunately it was already closed, so I drove into nearby Konya and stayed there overnight. The next morning I was at Çatal Höyük at opening time. The site is not very spectacular as far as ruins are concerned, it is just its very age that makes it so interesting. There are excavations on-going, and I watched that for a while. The next stop was the İhlara Valley. This valley is famous for its rock-cut Byzantine churches. Some of them have nice wall and ceiling paintings. From İhlara it is a short distance to Güzelyurt. The underground city is not one of the most famous ones, but is not very crowded with tourists. I was alone in there. Underground cities are not for the claustrophobic (which includes me). I did not go in there very deep. The rock-cut church in that town is worth a visit as well. From Güzelyurt I drove to Göreme, the heart of Cappadocia, where I stayed overnight. That evening I booked a balloon ride with Kappadokya Balloons, the oldest hot air balloon ride outfit in the area. They have a lot of experience. They usually fly with two balloons, one piloted by Lars, the other by his wife Kaili. Between them they have many decades and 1000's of hours experience. It was a fantastic experience. After visiting several of the valleys around Göreme, including the Love Valley with its phallus-shaped rock formations, I drove south and then east to Šanlıurfa. On the way I visited Birecik with its Eastern Bald Ibis breeding colony. This species is on the brink of extinction. This breeding station increased the number from a handful in 1990 to about 60 now. They fly free, but come back at feeding time. I stayed overnight in Šanlıurfa. The next day I drove south to Harran and the sites around it. This area is native Arabic speaking. I hired a guide to visit all the different sites, they are otherwise difficult to find. From Harran I headed for Mount Nemrut, another of the highlights of my trip. From Arsameia it is a long steep drive up a switch-back road. My car had an automatic transmission that you can switch to manual shift. This was really convenient, because it gives you more control when passing and on mountain roads. The only problem I had was on the drive up Mount Nemrut. The road was a very steep switch-back road. It was hot and I had the A/C on. Eventually, the transmission started overheating and slipping. It wouldn't shift correctly anymore, and the car started to slow down. When I realized what was happening, I turned off the A/C, but it was almost too late, I thought I would get stuck with transmission problems. Especially in the turns of the switchback, at the steepest points, the car would almost stop. That was when I encountered an excavator on the road. He had dug a trench right across the road to lay a pipe. I was afraid I would have to go all the way back to take the other route up Mount Nemrut. But he told me to wait a few minutes, he would have it done soon. And indeed, about 15 minutes later he had laid the pipe and filled in the trench and I was on my way. Those 15 minutes were also enough to cool down the transmission enough to get me over the crest. After that I had a couple of miles level road before the last climb up Mount Nemrut. It was enough to let the car cool off, so I made it up the mountain. This was the only time I had any problem with the car. I stayed overnight in a hotel on Mount Nemrut. The top of Mount Nemrut is at 2,150 m (7,050 ft). This site from the 1st century BCE is spectacular, it is one of the must-see sites in Turkey. From Mount Nemrut I headed northwest towards Amasya. On the way I saw Perre, a nice site from the Commagene Kingdom in the 1st century BCE, devoid of tourists. Next stop was Amasya with the rock-cut Roman tombs of Pontus. The next stop was the overnight at Boğazkale, the site of Hattuşa, the famous Hittite capital. Hattuşa was for me the highlight of the trip, a fantastic experience. It is a spectacular site. Not far away is Alacahöyük, a site that is even older than Hattuşa, but not as extensive. I still found it worth-while visiting. From there I drove to Gordion, a Phrygian site, where King Midas once lived. It has a very well preserved wooden tomb in one of the burial mounds, one of the largest old wooden buildings still standing in the world. The Phrygian Valley was the next destination. This has lots of very nice Phrygian tombs and other buildings. It is a very scenic valley and well worth exploring. The next night I stayed in Eskišehir. The next day I drove south-west to Çavdarhisar, the site of Aizanoi with a very well preserved Temple of Zeus, an interesting theater/stadium combination and several other Roman ruins scattered around town. From there I headed back to İstanbul. I stayed in İstanbul for a couple of days to see the sights in the city, including the Aya Sofya, the Blue Mosque, and others. Today's Turkey is a fairly westernized country. On the Mediterranean side, it is indistinguishable from any European country. However, the further east you go, the more it resembles a developing country. The villages are less affluent, the driving gets worse, trucks are loaded dangerously high, the cars are older, you see more horse-drawn carts, etc. There is a clear gradient in wealth and development from west to east. While I was there, Turkey was building up to elections with a vengeance. The election campaigns put their marks everywhere. You could see it in the villages with all the signs, the campaign trucks blaring slogans through loudspeakers, or on the road when you had to work your way through a campaign caravan of some 50 campaign vehicles. But at least they do have free elections. The people seem to be friendly. I didn't see many beggars. At the tourist sites, there are plenty of Hawkers, but it was not too bad. I found the worst was in İstanbul, where a man would start talking with you as if he was just interested, then tried to get you into his shop. One habit that is a bit strange for western European and USA citizens is to see men walking around holding hands. I have seen that in Muslim countries before. Most people in Turkey are Muslim, so mosques are everywhere. One night I had a little problem with that. In Pamukkale, the loudspeakers that send out the call of the Muezzin for prayer were on high volume. The whole town shook when they were going off. That happened at 4:40 in the morning, and almost blew me out of my bed. This was quite annoying. But that was the only town where I had this problem. I didn't make any hotel reservations in advance, I just found a hotel whenever it was time to stay overnight. This worked very well, except for the one time when I was seriously overcharged in Selçuk. There are plenty of hotels, and even in the high vacation and tourist season I didn't really have a problem. Hotels were mostly quite inexpensive (I did not go to the expensive resort areas). They were generally no-frills, but clean and comfortable. The food in Turkey is very good (as far as my taste is concerned ). Most restaurants are very inexpensive by USA Dollar and Euro standards. Since Turkey is a secular country, I didn't expect a problem with getting a beer in the evening, and I was right. There always was a bar or restaurant that served alcohol. There was one situation that I encountered a couple of times that was kind of strange. The glasses there are just a bit too small to hold a whole bottle of beer. The bartender would pour a glass, then take the rest of the bottle. It seems he collected the rest of each bottle for his own consumption, since he put these bottles in the fridge. When that happened the second time I asked for the rest of the bottle and got it. Driving in Turkey was not as bad as I was led to believe from my guide book. In the western parts it is no different from any country in western Europe. But the further east you go, the more challenging the traffic becomes. Driving gets more chaotic, and traffic rules matter less and less. There is one aspect of driving in Turkey that really hurts: The gas prices! I could drive only about 5 km (3.1 miles) for $1.00. That really added up. I drove about 6,000 km (3,700 miles)! Throughout the parts of Turkey that I visited, there was a lot of road construction. Turkey is really working on improving road conditions. Many roads have recently been or are being expanded from two lanes to four lanes. Unfortunately, the road surfaces in most places are tar and gravel, instead of smooth asphalt. That makes driving a bit of a problem with stones being thrown around a lot. No-passing zones were in most cases marked very reasonably, they were marked only as long as the area where you really can't see around the turn. Some of them were as short as 30 m (100 ft) (see pictures). This helped in preventing passing in no-passing zones, because frequently the no-passing signs were simply ignored, especially in the central and eastern parts of Turkey. Transportation is a lot with trucks, some of them a loaded really high. Many routes are crowded with trucks. In the mountains this can mean slow driving. Fortunately the expansion of four-lane roads helps with this considerably. Traffic is very heavy around the cities. I had a bad time around İzmir and in İstanbul. Outside the big cities traffic is not bad. Agriculture is important in most parts of Turkey that I visited. Almost everywhere you can find olive groves. Sheep and goats are common in most parts as well. On the Mediterranean side were a lot of sunflower fields. I heard that the sunflowers turn to always face the sun. This was evidently not true for Turkish sunflowers. They all face in the same direction in a field, but some of the fields had the sun in the back (see pictures). Turkey was a fascinating country to visit for seeing remains of ancient civilizations, which is one of my biggest interests. The sites I saw were fantastic, I wish I had had more time to see more of the sites, and to continue into the eastern part of the country and to the Black Sea. The people seem to be friendly. Prices are not fixed in most places, so you have to bargain, especially in all the tourist areas. Turkey is quite western in many aspects, but you still have the remnants of the habits of a less developed past. Altogether, I had a great time and saw a lot of interesting places.